I have been enjoying the sport of SCUBA diving for many years now both recreationally and professionally. SCUBA diving is possible today because of the extensive research, study and sometimes the lives of many others. I look at this much the same way as the Chinese proverb “How can one know where he is going, unless he knows where he has been?” In my paper I am going to look at the origins of scuba diving by first exploring how and when equipment was developed to breath underwater. Next I will research the first self contained underwater breathing apparatus, also known as scuba. Lastly I will cover an illness known as decompression sickens or DCS and how we learned to avoid it. The first diving invention was built in 1771 by a man named Doctor Freminet. This system was designed as a rebreathing system. The diver wore a suit that was connected to a container by two hoses. According to an article “Serious Diving History”, “Freminet called his invention Machine Hydrostatergatique. A number of dives were made and no fatal accidents occurred. Freminet stated that exhaled air was “regenerated” because the air ran through water-cooled pipes from and to the helmet. The container featured a ventilator that worked on a spring. Freminet said this influenced the regenerating process in a positive matter. On every dive he could stay below for several minutes” (www.divingheritage.com). Interestingly, there is not another recorded instance of anyone using a device such as this again until the 1800’s. In 1820, a fire started on a farm in England. No Matter how hard the fire fighters worked at putting out this fire, it could not be extinguished. The farmer was worried that his valuable horses would be lost in the fire; however, there was a man in the crowd who went and got a medieval helmet from a neighbor. He had the fire department pump air instead of water down the hose. Holding this hose under the helmet, he was able to go into the smoke-filled barn and rescue all the horses. This man’s name was John Deane (Alex Brylske, “A Brief History of diving” http://www.dtmag.com). John and his brother Charles got together and patented this “Smoke Helmet” for fire fighting. This was a great idea and they started manufacturing them, but John new that this idea could be used for diving underwater too. 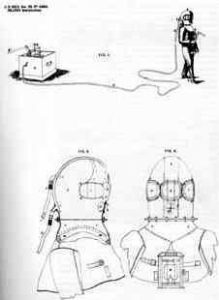 In the a article “A Brief History of Diving” we read ”By 1828 the original fire-fighting apparatus evolved into “Deane’s Patent Diving Dress.” He modified the fire helmet design by adding larger viewing ports and countered the effects of buoyancy with weighted shoes. A heavy fabric suit was worn to protect the diver from the elements, but the helmet did not attach to the suit. 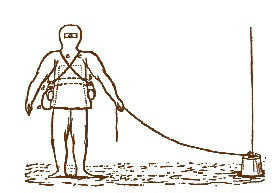 It merely rested on the diver’s shoulders and was secured to his waist by straps” (Alex Brylske, http://www.dtmag.com). This design is what the dive systems where based off of for the next 150 years. However this design was not ideal because the helmet was not connected to the suit. If the diver leaned over or tripped and fell, the helmet would fill with water and the diver would drown. But still the suit worked very well and these brothers became well known salvage operators (Alex Brylske, “A Brief History of Diving” http://www.dtmag.com). During the same year of Deane’s invention, a man named Charles Condert built what can be called the first SCUBA system. Self-contained means to have NO connection or support from the surface. 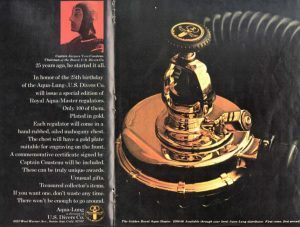 It was based on a design he saw in a magazine similar to today’s “popular mechanics”. This article reviewed the patent of a man named William James who created a design in 1825 from two versions of autonomous underwater gear (“Serious Diving History” http://www.divingheritage.com). To build Charles’s scuba unit, he formed a copper pipe into a semi circle creating the first scuba tank that he wore around his mid back. From this was a hose that went under a rubber hip length suite. He made a dive to twenty feet in the east river in New York where after a few dives he died. The cause of death most likely was that he fell over and the suit flooded drowning him and thus making him the first recorded scuba death (“Serious Diving History” http://www.divingheritage.com). Over the years many changes or improvements where made to dean’s Diving Dress. The most notable is a German instrumen maker Augustus Siebs improvements described in an article “A Brief History of Diving.” “Siebe only refined the Deanes’ design by inventing an efficient way of sealing the helmet to the suit and improving the exhaust system. By 1840, the “Siebe Improved Diving Dress” was introduced, and Siebe went on to found Siebe Forman and Company, one of the most famous diving companies in the world. It was Siebe’s system that became the true predecessor to the famous deep-sea diving dress familiar today to everyone” (Alex Brylske, http://www.dtmag.com). Some of the next advances were found during a salvage dive on the HMS Royal George which sank in 1783. It was not salvaged until 1839. Salvage operations were not finish until 1842. The operation was led by an Engineer named William Charles Pasley. During this salvage operation they tried many different diving systems. They found Siebe’s to be the best. With this recommendation, it became the most popular diving system of its time. Explosives where first introduced to salvage operations during the salvage of the Royal George in which lead encased barrels filled with gun powder where used (Alex Brylske, “A Brief History of Diving” http://www.dtmag.com). Today in recreational SCUBA training, you are taught to always dive in pairs. This is called the “buddy system”. The reason we are trained to do this is if one diver has an emergency, he is not alone. With another diver present, the buddy may be able to help the distressed diver out of the emergency. The Royal George salvage operation is the first recorded instance of this buddy system being used. Pasley had his divers work in pairs in order to help each other through the wreckage (Alex Brylske, “A Brief History of Diving” http://www.dtmag.com). often life-threatening squeeze on the diver. This is exactly what happened to Private John Williams. Fortunately, however, even though “his face and neck were swollen and livid, his eyeball capillaries ruptured and blood was flowing from his ears and mouth,” Williams survived, but he never returned to diving (Alex Brylske, http://www.dtmag.com). The next great advancement in the scuba system was a Refinement of Condert’s design. In 1863 T. Cato McKeen switched the tank to mount on the back and ade a rubber suit. There was a second air cylinder that was used to inflate the suit to bring the diver to the surface. This could be considered the first buoyancy compensator device also known as a BC or BCD. A BCD is a blader that divers wear today that they add air to which makes them neutrally buoyant; meaning they neither sink or float. 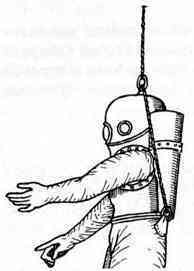 This makes them weightless, this is the only way to be like an astronaut without leaving earth (Alex Brylske, “A Brief History of Diving” http://www.dtmag.com)! We have talked about how the Americans built the first SCUBA system, but the most famous is the one made by a French naval officer, Auguste Denayrouze, in 1865. It was a surface supplied air diving system. A good description of how it worked is found in an article, “Scuba Diving – The Early History of Diving” “It consists of a horizontal steel tank of compressed air (about 250-350 psi) on a diver’s back, connected through a valve arrangement to a mouthpiece. Patented as the “Aerophore,” the device delivers air only when the diver inhales, via a membrane that is sensitive to outside water pressure: in effect, the first demand regulator for underwater use. With this apparatus the diver is tethered to the surface by a hose that pumps fresh air into the low pressure tank, but he is able to disconnect the tether and dive with just the tank on his back for a few minutes. 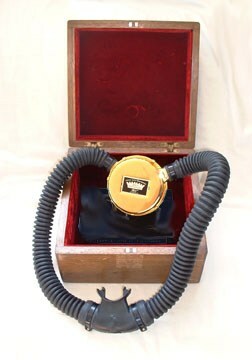 The Aerophore is a forerunner of modern scuba equipment. The apparatus was used by the French and other navies for several years, and also appears prominently in Jules Verne’s 1870 novel, ‘20,000 Leagues Under The Sea.’” Although it was used mostly as a surface supply system, it could be used as a “SCUBA” unit independently of an external surface air supply, but for a very short time (http://marinebio.org/Oceans/S_C_U_B_A/). So fare we have gone from surface supplied air systems to SCUBA systems, but according to Alex Brylske in his article “A Brief History of Diving, part 2: Evolution of the Self-Contained Diver” “Self-contained systems were extremely inefficient and required large air reservoirs. So by the 1870s, interest shifted to developing an oxygen system that could scrub and recirculate the breathing gas, a system that we today call a rebreather.” So, we are quickly switching directions to another type of diving system (Alex Brylke, http://www.dtmag.com). 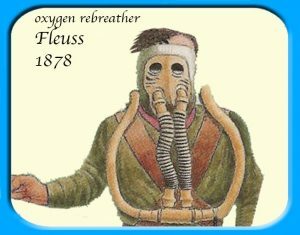 In 1878 an Englishman, Henry Fleuss, built a rebreather made of a rubberized fabric hood, a breathing bag and a copper cylinder full of oxygen compressed to 30 atmospheres (440 psi). 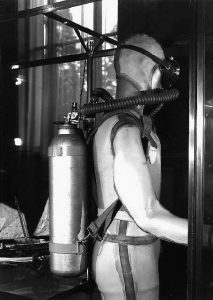 The tank and carbon dioxide scrubber was worn on the divers back. What this system does is remove the carbon dioxide from the exhaled air and the diver “rebreaths” this air. As he depletes the oxygen, the device adds more. Therefore the diver can stay down longer with a smaller tank. During some of the long dives with this system, a diver named Alexander Lambert almost died at 60 feet because they did not know pure oxygen was toxic below a depth of 20 feet. A system like this was used in filming J.E. Williamson’s 1915 version of “20,000 Leagues Under the Sea” (Alex Brylske, “A Brief History of Diving, part 2: Evolution of the Self-Contained Diver” http://www.dtmag.com). In 1900, the inventor and early underwater photographer Louis Bouton went back to the air based design. One of the most remarkable things he created was a high-pressure tank capable of holding 3,000 psi of air. That is the same pressure our tanks hold today (Alex Brylske, “A Brief History of Diving, part 2: Evolution of the Self-Contained Diver” http://www.dtmag.com). An inventor in 1918 named Ohgushi created an odd but successful system called the “Ohgushi Peerless Respirator,” it was much like the systems that came before him but his major contribution was using a more modern mask design, similar to the one used by early scuba divers. The main flaw of his system is how difficult it was to breath with it. A diver had to bite down on a valve with his teeth and breath trough his nose. To exhale you then had to breath out of your mouth. But still the Japanese Navy used this device in salvage operations at depths to 200 feet or more (Alex Brylske, “A Brief History of Diving, part 2: Evolution of the Self-Contained Diver” http://www.dtmag.com). Another compressed air tank scuba system was invented by Le Prieur. In 1933, he built a device with the help of Maurice Frenez. 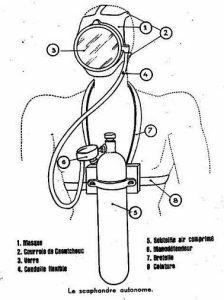 Maurice Frenez also had created a breathing system that Le Prieur saw in 1925 during a demonstration of a underwater cutting torch. 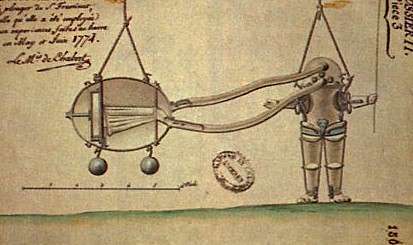 The system that these men built had a tank that had a hose that went to the divers mask. The diver regulated the flow of this with a valve on the tank. The bad thing about this system was how much air it wasted. It was a constant flow system so when the diver exhaled it also let out unused air (Alex Brylske, “A Brief History of Diving, part 2: Evolution of the Self-Contained Diver” http://www.dtmag.com). Now we have looked into breathing systems a lot. What about fins? In 1933 a French inventor named De Corlieu, came up with an idea for them and by 1935 fins were available commercially for the first time. However fins were brought to America by Owen Churchill. His fins where used by the frogmen of World War II and early sport divers. You can still see a trace of the Churchill design in use today. They are stubby, odd-shaped fins and are extremely popular among boogie boarders and body surfers (Alex Brylske, “A Brief History of Diving, part 2: Evolution of the Self-Contained Diver” http://www.dtmag.com). 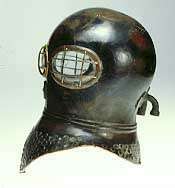 The dive mask also came into the Scene in the 1930s. The modern diving mask evolved from goggles. A Russian, Alec Kramarenko, improve on their primitive design while living in Japan. He Created a single glass lens with a rubber skirt which was held together by a wooden frame. The problem with this design was that it did not include the nose in the mask. So as the diver descended the air in the mask would compress from the pressure and cause an uncomfortable suction in the mask. Alec tried to resolve this by adding rubber bulbs to the ends of the mask which added air to the mask on decent as they where squeezed. The creation of the basic mask design we us today as well as the snorkel was created by a French man named Maxime Forjot. Other similar version of the mask was made by Jack Prodonovich at about the same time(Alex Brylske, “A Brief History of Diving, part 2: Evolution of the Self-Contained Diver” http://www.dtmag.com). 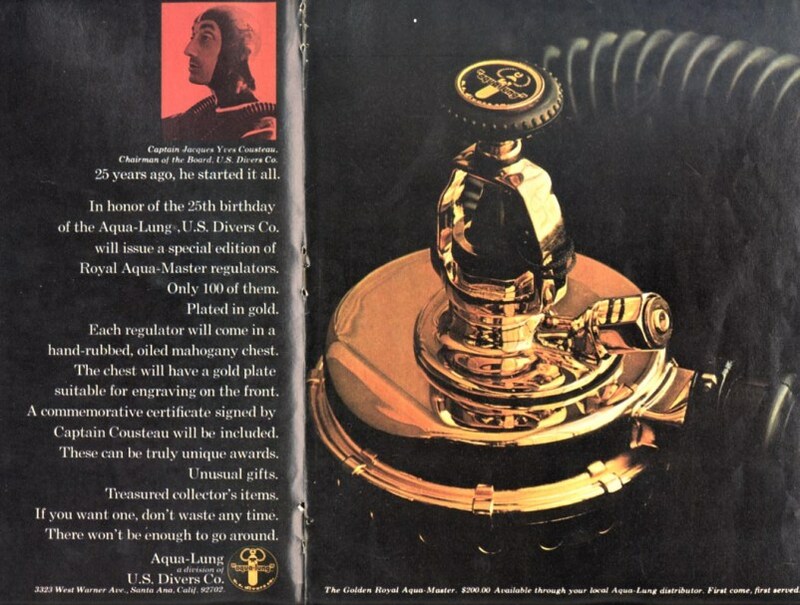 The next great advancement in diving equipment by Commeinhes in the article “A Brief History of Diving, part 2: Evolution of the Self-Contained Diver” “Commeinhes’ family owned a company that manufactured valves for the mining industry. By using his mechanical knowledge and his family’s ample resources, Commeinhes improved on le Prieur’s design. He retained the full-face mask concept, but placed the compressed air tank on the diver’s back. 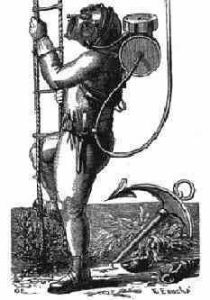 But more significantly, Commeinhes’ device abandoned the free-flow design of le Prieur, replacing it with a demand valve mounted between the diver’s shoulders.” This design was approved and used by the French navy and used to depths of 150 feet. Unfortunately Commeinhes was later killed in war (Alex Brylske, http://www.dtmag.com). Finally we have come to the greatest contributor to the SCUBA diving system we used today. 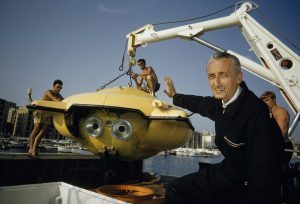 He was a French naval officer by the name of Jacques-Yves Cousteau. Cousteau was in a near fatal auto accident in 1942 and for rehabilitation, he took up underwater film making (Alex Brylske, “How Did We Get Here? A Short History of Diver Training” http://www.dtmag.com). We learn more about the development of this design in an article “How Did We Get Here? A Short History of Diver Training” “Being a naval officer, Cousteau was already familiar with a self-contained diving apparatus developed a decade earlier by another Frenchman named Le Prieur. So, Cousteau went to Paris in the fall of 1942 to meet with Emile Gagnan. A talented engineer whose specialty was valves, Gagnan agreed to help Cousteau. He proposed a valve based on a design he had invented that would convert automobiles from gasoline to natural gas” (Alex Brylske, http://www.dtmag.com). “Their original design was only marginally successful, and Cousteau almost drowned during a test dive. But after significant retooling, the device was pronounced a success in the summer of 1943. With a simple, safe and reliable breathing apparatus, the stage was set for the creation of the new sport of scuba diving.” Cousteau called this system the aqualung and it was brought to America in 1948 (Alex Brylske, “How Did We Get Here? A Short History of Diver Training” http://www.dtmag.com). decompression sickness, including six fatalities.” From this we learn that people who spent time under water would could come up feeling a lot of pain. This pain would cause them to curl up in the fetal position which is why people started calling this illness the “The bends” (Alex Brylske, http://www.dtmag.com). WE ARE: THE ORIGINS OF DCS THEORY” http://www.dtmag.com). Caissons despise or the bends is known today as decompression sickens or DCS. The greatest advancements in DCS theory was made by john Scott Haldane who started in 1905 forming what we call dcs tables. These table tell a diver how long he can stay at any depth before he risks getting DCS. To research this he created a chamber that he could compress to different pressures. This simulated a diver at depth. For his test subjects he used goats after finding they reacted a lot like people in this environment. In 1908 he released an article called “the prevention of compressed air illness” it also included a set of dive tables (Alex Brylske, “HOW WE GOTWHERE WE ARE: THE ORIGINS OF DCS THEORY” http://www.dtmag.com). I have been enjoying the sport of SCUBA diving for many years now because of people like Cousteau, who invented the Aqua Lung. Also, if it was not for Haldane, it would be almost medically impossible to SCUBA dive and avoid DCS. Going back to the Chinese proverb “How can one know where he is going, unless he knows where he has been?” We now know where we have been and because of these men’s efforts, further advancements are continually being developed like dive computers. These instruments put Halanes table into a computer that makes dive calculations on the fly. Today’s SCUBA divers owe a lot to these men and the least we can do is remember them.